Six bedroom villas are a dream for groups since they tend to offer a generosity of space that suits big gaggles of friends and inter-generational family gatherings best, as well as those looking to celebrate a special event. There's often one or two twin bedrooms plus an easily accessible room suitable for elderly rellies. We just had so much fun staying at Villa Amanzi. We were blown away by how beautifully its unusual modern design fits with the tropical setting. On seeing the villa for the first time, we could just imagine this scenario: A man meets his architect at a bar to discuss plans for a new villa. The man orders a drink: "I'd like it on the rocks, please!" The architect dutifully executes this request, et voila! Amanzi is born. But this was no accident, of course. 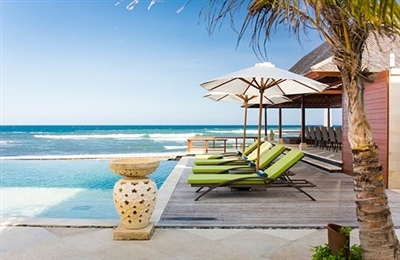 Amanzi's design takes full advantage of the property's unusual natural features and does not impose – less imaginative people might have simply blasted the rock out to make way for the villa. We enjoyed trying out all the high-tech bells and whistles such as the touch-screen control panel and were constantly surprised by all the fun little design details such as the two 'windows' on the swimming pool's bottom that formed funky blue 'skylights' to the floor below – one in the family room, the other above the balcony. Another plus was that all the electronic controls and buttons were clearly labelled and easy to use even for techno-phobes such as ourselves. In the end, however, nature won out as we delighted in listening to the crashing waves and birdsong, and watching in awe as the sunset skies turned the infinity pool into a luminous blaze of gold, pink and red. Our visit to Baan Puri involved two families and the kids had an absolute ball, which meant we did too. 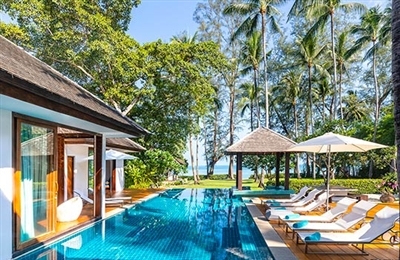 Water plays a major role at the villa, with ponds, waterfalls - that huge 30m pool - and the waters of the Gulf of Thailand a constant influence. A particular joy is that, despite the villa's opulence, it remains refreshingly simple and focuses on what matters most during a beach holiday: comfort, privacy and the opportunity to enjoy the location to the full. The staff were an absolute delight with the villa manager taking the kids under her wing as only the Thai’s know how and a superb chef who could cater for all tastes.Every room is designed to keep you all but physically attached to the view and the options for outdoor enjoyment are countless. A particular pleasure was the large circular daybed on the terrace in front of the beachfront bedroom, reclining with a chilled drink, breathing in the breeze with the pool and ocean before you can only be described as sublime. Versatility is another advantage. 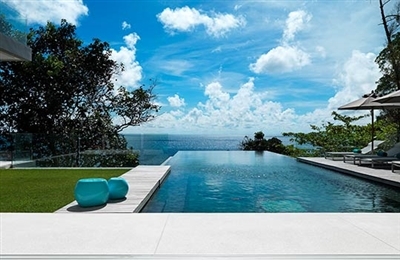 The sheer size of the property, combined with its sensitive design, mean Baan Puri can happily host several families. There's even a table tennis table, beach toys, a Kayak, bikes and DVDs to keep the kids entertained when not in the pool or on the beach. 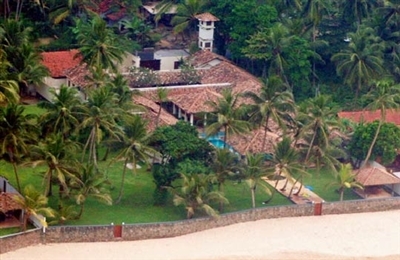 But the villa would also be perfect for a large gathering of friends or a special celebration. Who could resist a party on the lush beachside lawn? Of course, not even high-end residences escape the odd architectural over-indulgence, but at Baan Puri, the few there are add character rather than inconvenience. A cliché I know but the only real disappointment was leaving. It's not difficult to settle into 'the House on the Beach'. As soon as the sliding gate shuts out the roadside bustle, a relaxed atmosphere takes hold, coaxing you to kick off your shoes and switch into holiday mode. The villa was originally designed as two separate residences and although this creates a few anomalies (such as two lounges, which seems a little excessive), we felt the symmetry between the left- and right-hand accommodation would allow families or friends the choice to spend time with or without each other when sharing the villa. The more significant division perhaps, is between the front and rear. Staying in one of the front-facing master suites is a real treat as you enjoy constant sea views, instant pool access and special additions like sunken outdoor bath tubs but, depending on the group dynamic, this may cause a little bedroom envy with those occupying the rear guest rooms. Having said that, everyone benefits from abundant communal comforts and homely touches (including a good selection of books and DVDs) which, combined with the great sound system and the huge flat-screen TV in the AV room, add to the general sense of privilege. Days slip by gently at the poolside, with the wide, comfy hammock providing the ultimate excuse to do nothing but read, swim and snooze. To really appreciate the villa's idyllic location and make the most of the relaxed atmosphere that pervades, ask the helpful staff to set a table on the deck or lawn in the early evening, then drift from sundowners into dinner before turning up the music for a pool party. Ban Suriya is one of those villas where, as reviewers, you find yourself looking for something negative just to tick the ‘Surprises’ box. We failed. Our time passed far too quickly at Ban Suriya. In fact, a month would probably be needed to enjoy the villa to the full. It's not only the salubrious surroundings that stand out, it's the way everything seems to go that extra mile to please. There's not just a computer, there's an iMac packed with tunes that you can play through Bose speakers in the lounge and poolside sala (gazebo). The gym is not only well-equipped, it has a fridge, and a plunge pool bigger than some other villas' main pool. Even the DVD collection includes films you wish you'd remembered to buy at the airport. Ironically, even with so many options we found ourselves drawn to the simplest – the tree house by the beach. The staff is clearly proud to be part of the Ban Suriya experience and the live-in manager was knowledgeable and keen to help us appreciate the villa's pleasures. Although each bedroom is noticeably different, with no one losing out, the master is clearly the most extravagant with its terrazzo bath tub and ensuite lounge. Clever design touches in the guest rooms like direct pool and jacuzzi access, indulgent semi-outdoor bathrooms and hand-picked, stylish furnishings ensure everyone is content, while those staying the twin bedroom by the games room and gym or cosseted in the beachfront pavilion also enjoy complete privacy and independence. 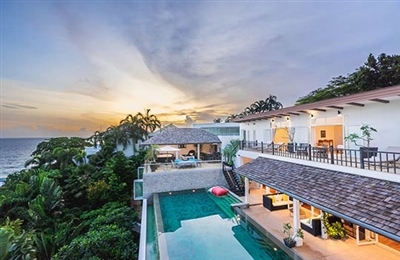 Eight people is probably the minimum number you would need to fully appreciate this villa (there's an option to rent four bedrooms outside peak season), otherwise you might struggle to appreciate its exuberance. Our stay at Villa Bayu Gita was brilliant. It’s as simple as that. The comfort factor, the professionalism of the staff, the excellence of the food, the fantastic facilities and the gorgeous views all combined to create an exceptional villa experience. There are not many villas in Bali that sit so close to the ocean that you can feel it in your face, literally. During the highest tides, the sea comes right up to the base of the sea wall at the front of the villa and can create quite a show. Entertainment wise the villa has a marvellous home cinema with recliner chairs and an 80-inch screen, a very well appointed gym and a billiard room, all downstairs in the basement where sound is not an issue. Upstairs it’s all about the pool, the sun and the ocean views with lots of sun loungers on the pool terrace and sofas both inside and out. The bedrooms are all very private, generously sized and comfortable so that you can really enjoy some downtime when you need it and guests lucky enough to draw straws for either of the two master suites can luxuriate in their own private plunge pools – the front one facing straight out to sea. 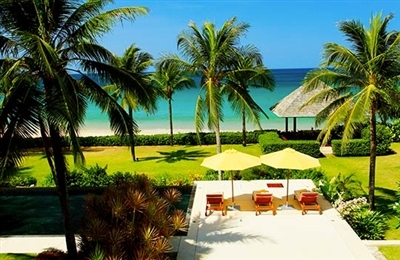 We thought that the villa would make a wonderful beachfront wedding venue – it can cater for up to 80 guests. And an added bonus is that it can be rented in conjunction with the serene 3-bedroomed Bayu Gita Residence, just a few metres away.